The South of France and in particular, Les Saintes Maries de la Mer is one of my favorite places in spring. It inspires renewal, reconnection with your spirit, and a chance to experience vast seaside spaces. 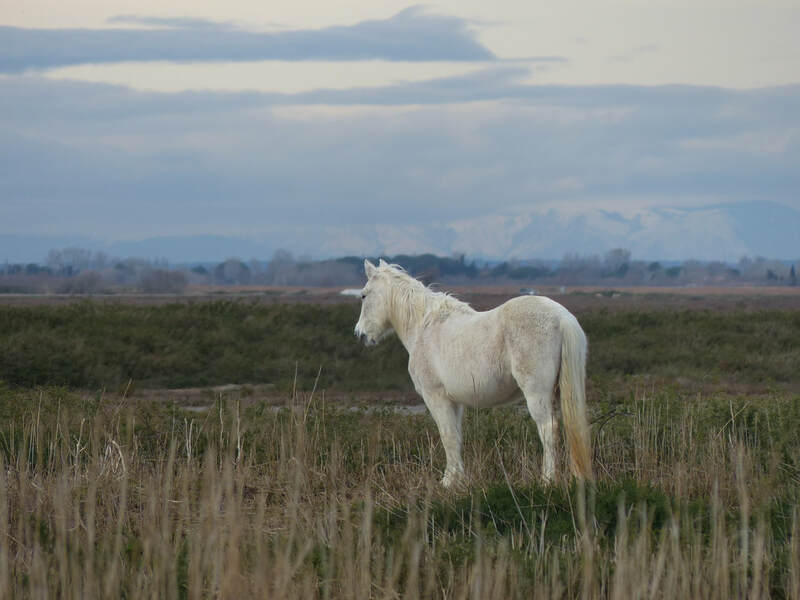 This luxury travel retreat takes you into the Camargue to explore the symbols and nature of one of the most wild and beautiful areas of the country. In spring hundreds of flamingos flock here to mate and we may get a glance at them as they parade through the lagoons. White horses also roam along with black bulls. The anchored heart acts as the symbol of this magical location where an annual gypsy festival celebrates the Black Sara of Kali who is in the ancient stone chapel. A flock of flamingos flying over a lagoon in the Camargue. The retreat is for anyone looking for inspiration. I find that travel is one of the best ways to ignite that creative spark. There will be moments where we will visit sites interspersed with time in cafes and alone time to write and reflect. You'll also be encouraged to work with your dreams and explore the meaning of symbols and synchronicity. If you're thinking about writing a book or starting a blog, this adventure may give you the courage to step out of your usual comfort zone and act. You'll be encouraged to trust your inner voice and gain more Self-confidence and trust the inner whispering of your spirit as you align with it more deeply. Past retreats have attracted participants from all around the world and from a broad array of backgrounds including scientists, lawyers, people in healing professions, yoga teachers, artists, students, retirees, and people in transition looking for a new career. People have come from as far away as Los Angeles, California, New York City, Switzerland, France, Germany, India, and Tasmania, Australia. This travel retreat will provide an opportunity to step out of the ordinary rush into a pristine natural area of the French Alps. In this silence and natural beauty, miracles of self-discovery abound. Bring an open heart and mind and give yourself a chance to experiment and enjoy your natural creativity in a beautiful environment. Give yourself a gift of space and time to reflect on what's important to you. We'll travel together in a small group from Annecy to les Saintes Maries de la Mer (count a little over 4 hours) in a small group. The drive time will be a chance to talk about your projects and ideas and enjoy the scenery. We will arrive at a 4 star luxury hotel in the afternoon where you will have a chance to relax and use the spa facilities. You're also welcome to join us directly at the hotel if you choose to travel individually. This retreat aims to re-ignite your sense of adventure and trust in yourself and your innate connection to your Creative self. Price includes 2 nights lodging in a single room in a 4 star hotel with breakfast and one main meal per day from Friday evening to Sunday, transportation from Annecy train station, and workshop fees. Travel to the Retreat: The closest international airport is in Geneva, Switzerland. Regular shuttle buses travel between Geneva Airport and Annecy. Debra will provide detailed information about the ideal ways for you to travel to location depending on where you plan to arrive from. Give yourself a gift of space and time to explore your intuition and inner life through travel and writing. Debra Moffitt is an award winning, American author who teaches writing, creativity, and spiritual practices to access inner wisdom and inspiration. In addition to writing books, she also writes for many luxury and consumer magazines and is Editor in Chief of the Luxos Guide to Switzerland. Debra draws on intuition and experience to guide participants to connect with their own inner wisdom during workshops. She lives in France. Debra's retreats and programs have been selected as among The Write Life's top retreats since 2014. Departure from Annecy train station at 10:00 a.m. Arrival at the hotel in Les Saintes Maries de la Mer approximately 3:00 p.m.
9:00 a.m. Meditation, check-in on dreams and experiences, and introduction to planned excursions. 3 - 6 p.m. Afternoon program and excursions to look for flamingos in the lagoon. 9:30 to Noon: Leisurely start with exploration of dreams and intuition. Please note that times are indicative and may vary according to weather and traffic.